Gothic cathedrals are miracles of stone and glass. Their predecessors of the Romanesque style - cathedrals, churches, abbeys - led the way to these grand statements that defy gravity in a era well before steel and reinforced concrete. Cathedral and churches from the 11th through 14th centuries in France are breathtakingly tangible reminders of the fervent Christian climate of the late Middle Ages. They are crammed full of stories, in every sculptural detail, in every glint of a stained glass window, with layer upon layer of meaning, often making for intriguing puzzles for modern eyes and minds. Are you planning a trip to France? 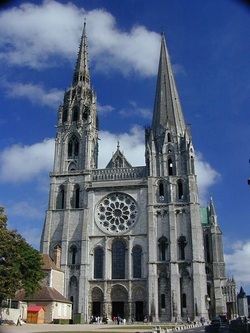 Cathedrals and churches will be among the most visible and interesting sights. Would like to get more out of what you'll see? Would it just be fun to have the pleasure of learning more about this fascinating architecture? Is your book group reading Ken Follet's stories - Pillars of the Earth, World Without End - would you like to more of the story? Contact me for more information about small group ArtSmartTalks. Also available (and if location makes an in person talk impractical): customized email or hard copy packets with art and art history information to fit the itinerary for an upcoming trip - A great way to get more out of your travels. Contact me for more information.